The system is so small that it doesn't even include a standard 3.5 mm audio jack. The current configuration is equipped with a Celeron N3350 CPU with support for up to 4K video out via HDMI. Measuring just 70 x 70 x 31 mm, the ECS PB01CF is one of the smallest mini PCs currently available with an integrated Apollo Lake processor. Its CPU is a dual-core 2.4 GHz Celeron N3350 that should be capable of operating at slower clock rates if necessary depending on the cooling solution and processing load. Meanwhile, the integrated HD Graphics 500 GPU should be capable of outputting up to 4K at 30 Hz via HDMI. Audio must be passed through HDMI since there is no dedicated 3.5 mm audio jack. To be fair, the PB01CF uses a small external AC adapter not unlike laptops and other mini PCs, and so its "real" size is slightly larger. Nonetheless, the adapter is just 24 W or a fraction of what most laptops and mini PCs require. The rear of the unit will support VESA mounting on compatible HDTVs and monitors. ECS caters to business users and has yet to announce any prices or official retail stock for the PB01CF. 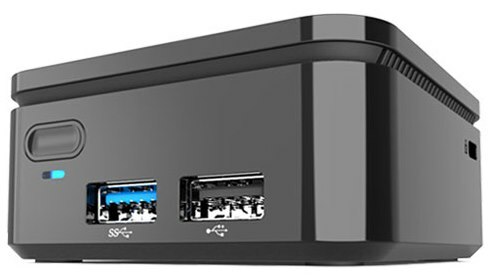 Its small size and versatility, however, will likely appeal to HTPC setups and home users in addition to office and conference room settings.